On the top right of the app, click on the settings button. This will take you to the account setup page. Enter your username and password for the frequent flier accounts you want to use to perform searches and click the Save button. Currently only EY doesn’t require login information. Once you’ve saved your login information, the search screen will load. Once the search is complete, you will see the results displayed. You can filter out results based on connecting city/carrier/cabin to filter out unwanted options. Click the “Save this search” button to save the inputs used for the current search for quicker searches next time. Get the Chrome app now! 2) The connecting flight dates are somehow messed up, it looks like a year later. Sure, anywhere is fine. Here or a PM on FT or in the FT thread. Hmm that’s weird. Can you give me a sample search to run? It actually seems to be fixed. Maybe I was still running the previous version until I closed and opened it again (? Yeah that could have been it. Thanks for reporting the bug though! Downloaded the app but I’m really not crazy about providing my frequent flyer username and password. Is that info really necessary to do a search? Yes it is. The only carrier that doesn’t require you to log on is EY. If you’re worried about providing that info, you could create dummy accounts and use those. Just some feedback – searching QF JFK – SYD on 13th Sept shows F availability, when in fact it is W.
Are you still updating the App? The AC Search fails now since the updated the Aeroplan Website. Will you be updating the App? I am still updating the app. I will update it for the new AC site soon although AC seems to be updating their site every 2 weeks. I’m not sure if it’s worth the effort of keeping AC as a search option. 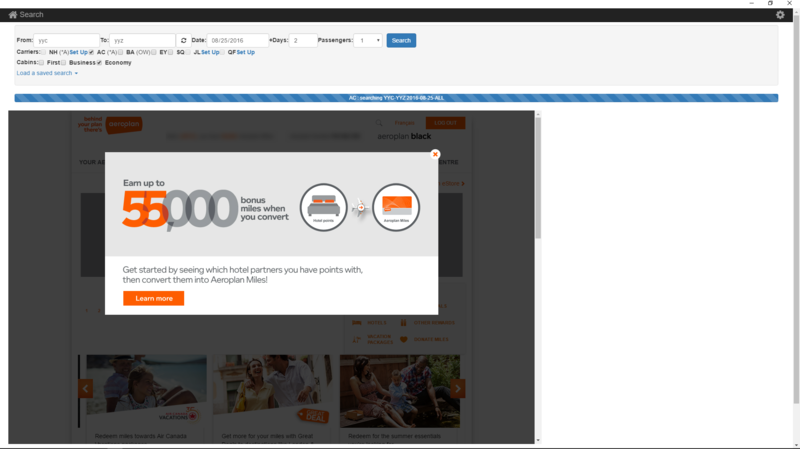 I think Aeroplan has tweaked their site again. Can’t run any searches. I’ll get to this as soon as I can. Thank for letting me know. Isn’t JL Japan Airlines? Why are AA, BA etc as sub-options? The JL search is for their partners only and not on JL itself. JL gives you the option of searching space on those carriers. Apparently NH searching is no longer show any results. Is this a temporary issue? Hmm seems like something’s changed on their site. I’ll take a look at it. Thanks for letting me know. Looks like JL is not working. Debug mode shows the JL homepage and never moves from there. Issue with JL search. Debug mode shows it sitting on JL homepage and never moving. In addition, from a UX perspective the labels and selections seem to have some odd spacing. For example, the BA selection checkbox is next to AC, and the checkbox next to BA is really for EY. Same issue on the Cabin selection. Food for thought. JL has suspended access to their site for US accounts, so if your account is US based it won’t work. I haven’t tried to create an account in a different region so I can’t say if it will work using a different region. Thanks for the feedback on the UX stuff. Searching for First/Business class seats on BA sometimes shows Premium Econ seats. Is there a way to not show those results? ba stuck at initialization process. I seem to be able to search BA fine. What does the page do when you turn on debug mode? Search SQ error “please enter valid login” otherwise it works great. It seems to still be working for me on 2 different computers. Sorry for the newbie question. Can you provide specific terms for NH,SQ,EY,JL,QF? I gathered that BA is British Airways. I am going through my frequent flier programs, and can match anything besides BA. Is it possible to have Filter as GLOBAL settings? Great app, thanks for all your hard work. Would it be possible to add a number of connections filter? I.E. in addition to non-stops only, you could pick ‘max 1 stop’? I’m on Version:0.0.0.78 Thanks. Thanks. That’s a good idea. I’ll put it on the list. Awesome app, very impressive, saves a ton of time. Same comment as Tom McKay regarding stopover/direct. Additionally, SQ just spins and says initializing, when in debug mode, it seems that it is cycling on the log-in page and will not proceed to the search. It seems to be working for me. Is your account still active? I know when mine expired, it did the same thing. Is this still happening for you? It’s working fine for me at the moment. Hello, first off, thanks for making this tool. It is INVALUABLE for the Travel Hacking community! I have noticed lately that Aeroplan seems to be having some issues with searches. The first search runs fine but the second search hangs on the first date and doesn’t return results. I have also seen where searches are not returning any results. For example, I searched SIN-SYD for May 1-30 and it went through the search but returned 0 results. When I checked on Aeroplan, there were flights available for all days. Not sure if it was a parsing issue but it was the first time I’ve seen that. Is it happening just for SIN-SYD?. I do notice it sometimes hanging on AC searches but I can’t quite recreate it on demand so trying to figure out what happened is tricky. I just ran a search SIN-SYD for your dates and it completed with results. Is it still happening? Yes, still happening. It’s not the initial search that hangs, it’s all subsequent searches. I just ran TPE-YVR for 11/25/16 + 15 days for 2 on Aeroplan and it returned results. The subsequent search YYC-YYZ on 8/24/16 + 2 days hung. If there is any way to troubleshoot this for you, I am happy to help. I have a bit of a programming background so I may be able to lend a hand. Just found a bit of a workaround. It looks like the program hangs due to the popups that take focus away from the main screen. If you X out of the popup it still hangs but if you click on logout, Award.Flights manages to log in using the supplied credentials and re-run the search. I am almost positive this is due to the popups that are stealing focus and preventing your program from executing the proper next steps. Hi there, thank you for the great app! I’m bummed though, because it seems BA search just doesn’t work for me anymore. It just is stuck at “initializing” and never moves past that. Has anyone else reported this? I am positive my login data is correct, and I was having success last week by doing the BA Captchas in-app. But BA search just stopped working complete a few days ago. That appears to have fixed it. Thanks! I’ve tried uninstalling and reinstalling the app, BA search still hanging at Initializing.